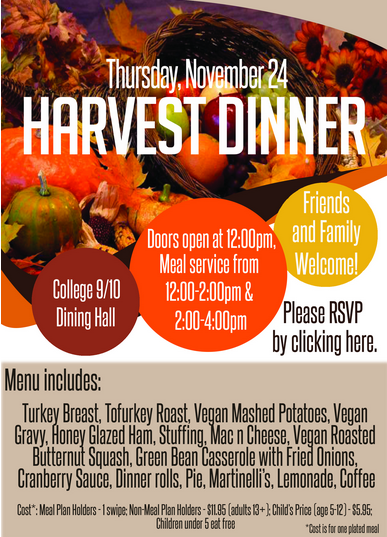 Click here to RSVP for the third annual Harvest Dinner. The Dean of Students Office, in collaboration with UC Santa Cruz Dining, the International Education Office, and the American Indian Resource Center, is holding its third annual harvest dinner at the College 9/10 dining hall Thursday, Nov. 24. Doors open at noon with two seatings planned, noon–2 p.m. and 2 -4 p.m.
Students, family, friends, and children are welcome. Cost is one swipe for meal plan members, $11.95 for adults; $5.95 for children 5-12; no charge for children under 5. Reservations may be made at this Google form. For more information please contact deanofstudents@ucsc.edu.